I’m sitting here in our luxury accommodation listening to an adverse weather report on The Bay local radio station. What a difference from yesterday. We’d been promised dull and cloudy weather and low temperatures, but that wasn’t to be. It was, in truth, a perfect Bank Holiday Sunday, warm and sunny and still – perfect for strolling with an ice cream along the promenade, not necessarily for running a half marathon. We’d arrived at Knott End, just across the estuary from Fleetwood, on Saturday lunch time. The camp site was small and perfectly formed, with more than adequate showers, clean toilets and within walking distance of the shops. Now a well-oiled machine, we erected the trailer tent and awning within an hour. I’d found, through the internet, some gluten and nut free ready meals by a company called Ilumi and had chosen enough for two meals. This saved my usual panicked race around a supermarket I didn’t know searching for something I could eat! The local ASDA provided us with some ‘meat’ for sandwiches (Quorn Roast Chicken style in my case, not so Quorn in hubbie’s) and some bread rolls and we enjoyed a late take away chip shop lunch as we headed home. It’s all carbs. I was bulking up, literally. Truth be known I was struggling to eat anything. I’d acquired a cold in the week and by Friday I was feeling quite bad. As an asthmatic I have to very careful when I get a cold because the symptoms are exacerbated. I’ve ended up with severe chest pains before, with which I probably should have gone to hospital, but I’m the type to battle through illnesses rather than ask for help or get medicines. This information will come in handy later. Read on. When we settled down in the evening to have our first Ilumi meal (Moroccan Tagine for me and Zatar Chicken for hubbie) I felt as if I could be sick. The only thing that kept me eating was the fact that these meals weren’t cheap! I couldn’t waste them! However as I ate I did start to feel better and by the end of the meal I was feeling okay. My stomach hurt and I wasn’t comfortable, but my cold felt better. Maybe it would be alright after all. 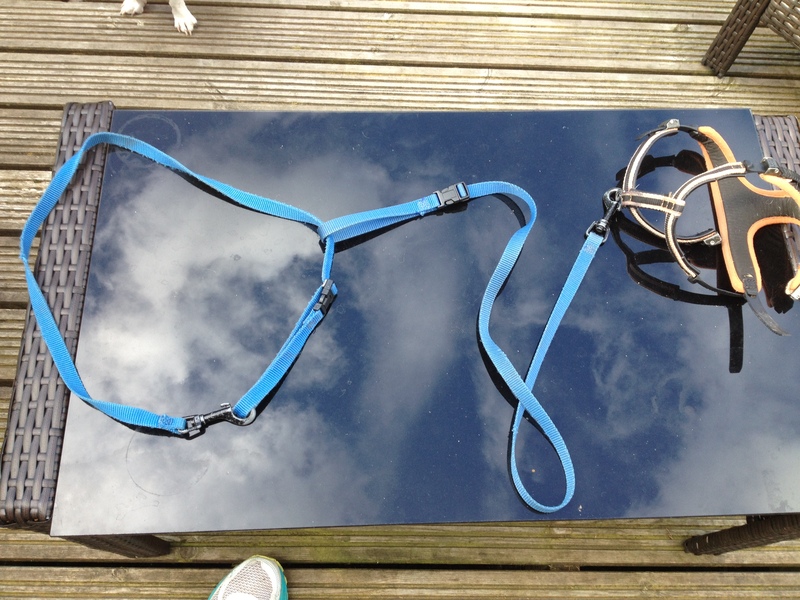 I decided that a walk with the dog might help, so I harnessed him up and we left, joined by hubbie. I’d said at the start that I didn’t feel up to a long walk and was trying to conserve energy for the race. 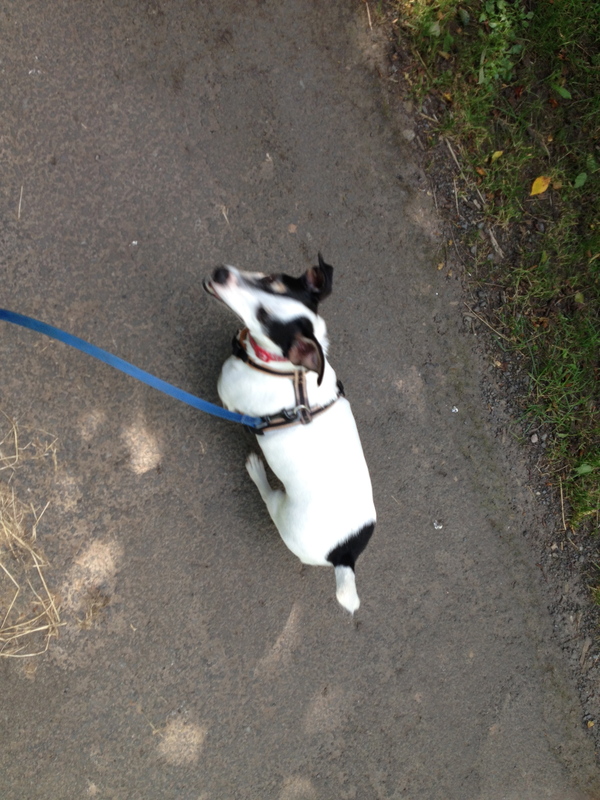 We ended up walking about three – four miles and I was totally exhausted! My legs ached, my head hurt and I was tired. One strange film later we hit the hay. Full of enthusiasm for another race (it’s like childbirth, you forget how awful the previous one was) I was dressed and breakfasted and ready at just after 8. We had a thirty minute drive round to Fleetwood itself, but we’d checked out the venue and knew that we had plenty of parking. There was no panic. And, right enough, we were able to drive straight to the start and park in a semi-empty car park. This was so different from the debacle of larger events. No getting up at silly o’clock, no trying to negotiate unfamiliar public transport, no worrying about where to leave bags or where to meet up with loved ones. I collected my number (no chip) and joined the toilet queue. The race started at 10 with a crack of a gun firing. The course consisted of ever increasing loops of the same roads. Mostly we ran along the pedestrianised promenade, with gorgeous views of the sea. This, combined with joining the parallel public road, gave us the first 6 miles of the run. People sitting at the start got to see us run past three times in all. On the third loop we were taken right along the promenade towards Cleveley. By then the temperatures had started to climb and I’d taken to wetting my headband at water stops in an effort to stay cool. I’d started off well: mile 1 – 10.05, mile 2 – 10.34, mile 3 – 10.40. I was running 3/1 run/walk ratios and trying to keep as close to 10 minute miles as I could. When the temperature started to climb I started to struggle to breathe a bit, so I reduced the ratios to 2:30/1. Obviously this affected my times, but at mile 6 I still had a reasonable 10k time. This is where it started to go pear-shaped. I was running as close to the promenade wall as I could so that I could benefit from the shade. By the time I got to the mile 8 marker I was starting to gasp at the end of run intervals and the walk intervals just weren’t long enough for me to recover my breath. Suddenly things started to go dark and I was seeing stars – I knew that if I didn’t sit down and get my inhaler I was going to pass out. Having an asthma attack is difficult to explain, unless you’ve had one, because it all happens so fast. All I can say is that I managed to get my inhaler out as I sat down, had a couple of puffs which I didn’t think would do anything because I didn’t feel as if I’d actually taken a proper lungful. Several runners slowed down to ask if I was okay and offered to get a steward. I thanked them, reassuring them that I’d be okay once my inhaler kicked in, although I had no idea if I would be! After a minute or so I was able to get up and walk and I continued running a little bit after that. I was well behind pace, but, by this point, I’d put aside any thoughts of running a PB! I just focused on finishing. The course took us away from the shade of the prom wall and into the full glare of the sun. Runners around me were struggling. I was now running with the limpers and those walking more than they were running. I did make up a lot of places in that time, but again I’d had to reduce my run/walk ratio to 2/1. I was struggling too. At mile 10 I hit the road, literally. Hyperventilation caused another attack and I had to sit on the kerb for a few minutes whilst my inhaler did its job. I’m not the most patient of people and a couple of minutes felt like an eternity. I decided to just get back. Forget the time. I decided to run/walk 1/1. I could manage a reasonable one minute run without gasping. It was my new plan. I caught up with a woman in obvious discomfort. We chatted as we ran and she said that her foot and hips were hurting. She explained that she had a little boy and with no one to look after him had had to do all her training on a treadmill. She wasn’t road-ready. I sympathised. Some runners can be so dismissive of barriers to running. Instead I said that I was run walking, if she wanted to run with me. 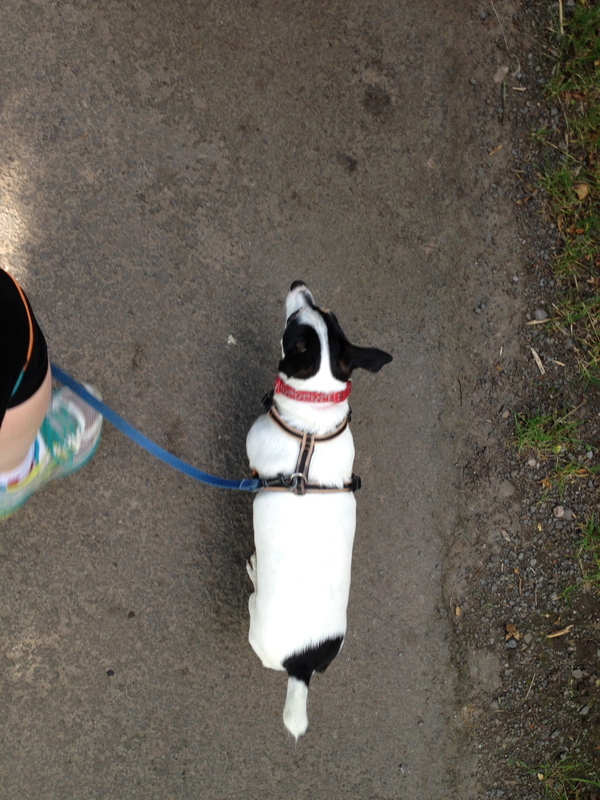 We ran the last two miles together, using my Gymboss timer to beep runs and walks. We were within a mile of the finish when some smart Alec ran alongside us asking “Have you two been disqualified for running too slow?” Considering that we were far from last and well within the course cut off I was annoyed by his glib attempts at mockery. “Get stuffed!” I shouted back. “Go and annoy someone else!” I couldn’t believe that anyone would be so unfeeling. It was obvious, from the way she was running, that my companion was really hurting and was incapable of running faster. 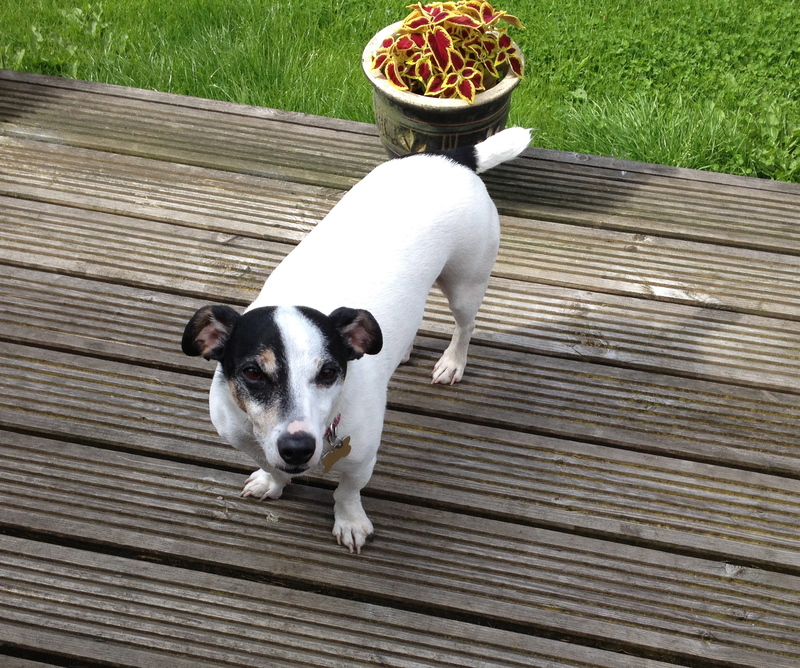 I daren’t run any faster! This idiot didn’t spur us on, he just appalled us. Coupled then at half a mile to go with the bloke who shouted “I’m 75 and I finished ages ago!” you can imagine how rubbish we felt. I think I swore at him. I must admit that I could have run the last two miles faster. The ratio was fine and I was easily running my minute, but my companion simply couldn’t run any faster. I tried increasing the pace, but I kept losing her and at that point I felt that she might not finish. I could have run on and made up some time, but my heart told me to stay and help. What would you have done? We crossed the line together, hands held aloft. We weren’t last by a long chalk and we had finished. My Garmin says 2:41, but I’m guessing when I collapsed it went into auto-pause. I don’t really care. I collected my medal, met up with my hubbie and we trundled back to the campsite. I felt awful. The trip back was uncomfortable and even though I’d eaten a banana after finishing I knew that wasn’t enough. By the time I’d shakily managed to make a sandwich I was well past it. I was struggling to eat the roll and ended up just eating the Quorn chicken! After that, a hot cup of tea and a shower I felt fine and we walked to the local pub for a pint or two. Today my cold has landed firmly on my chest and has turned into an infection (I won’t share how I know that, it’s not very pleasant!) I’ll now have to watch that this doesn’t get worse. Lessons learned? Well for one, despite everything, this was a good race to do. It was friendly (mostly), easy to get to and from and cheap to do (£17). I didn’t get a goodie bag, but along with your medal there was ample bananas, cheese crisps, wagon wheels and water to collect. I didn’t get a T-shirt, but I usually pay extra for those anyway. On a negative I was daft to run with a cold. I realise that now. I realised it at mile 8 and mile 10 when I was lying at the side of the road. I’m asthmatic and I shouldn’t ignore that. I also need to have a post run meal ready so that I can just eat. I usually have a soya milkshake and an oat bar, but remembered neither. I was a wreck by the time we got back to the campsite and my hubbie was too Inexperienced to realise it. He thought because I’d eaten a banana I was fine. I’m annoyed by the comments passed by others as we ran. My hubbie witnessed another incident where a steward shouted at a woman to “RUN!”, going on to tell her that it was a running race and if she couldn’t run she shouldn’t be competing. The steward was worried about how long she’d have to stay if people had resorted to walking. Unsurprisingly the runner turned on the steward; my husband thought she was going to hit her! Do slower runners need that kind of abuse? It does make you wonder about entering smaller races where you might be at the back. 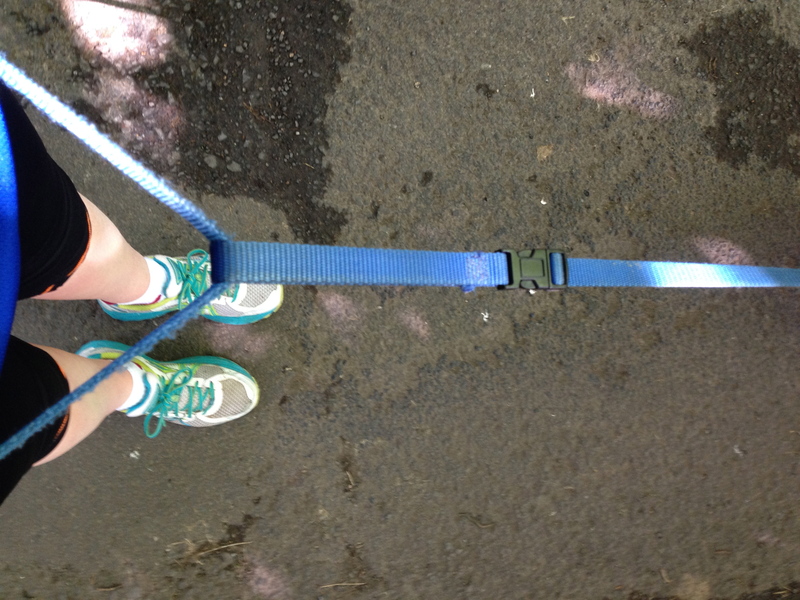 It also makes me worry as a Run:Walk:Runner – am I opening myself to abuse if I’m seen to be taking walk breaks? We’re just home and until now I hadn’t emptied my Camelbak of its remaining contents. To my horror out of the 0.5l I took more than half was still there. In my attempts not to drink too much I may have drunk too little. This is the drawback of the Camelbak; hidden on your back there’s no way to see how much you’ve drunk. All the way round I was trying to make sure I had enough water by limiting my intake. In reality I had plenty and should have had more. This too may have contributed to my unwellness. I think I may have to go back to wearing a waistband with bottles I can see through! I think, if I’m well enough (!) 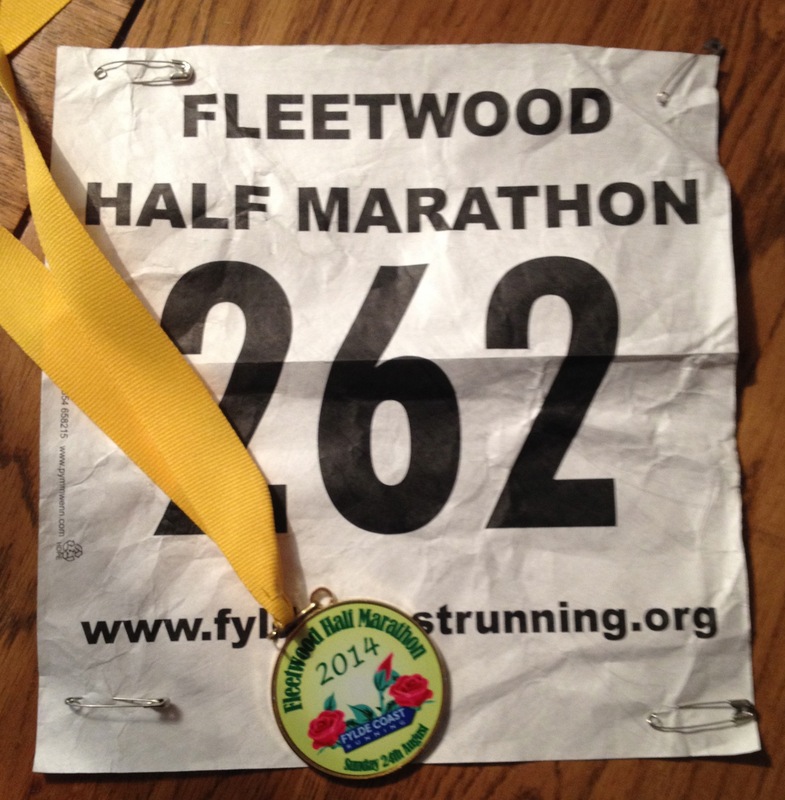 I’ll do this event or another organised by the Fylde Coast Runners next year. I’d hate to judge an event by one bad experience mostly caused by my own lack of wellness. I contacted the event organisers via Facebook, explaining what had happened and immediately received a phone call. They were concerned, apologetic and assured me that they would do what they could do to prevent the things that happened to me from happening again. It’s a new and encouraging club and I would hate for other runners to be put off by the behaviour of three people (all probably nothing to do with the club!) out of a cast of hundreds. Not just any birthday, but what’s known as a ‘significant birthday’. I was very precise about the whole turning 50 affair. I was born at 12:45 on 21 August 1964, which meant that I turned 50 at 12:45 on 21 August 2014. Until the hand ticked across the 12:45 minute time, I was still just 49! Not that age really bothers me. I’m good for 50, I don’t feel whatever 50 is meant to feel and I’m certainly fitter and healthier than some people half my age, so actually I’m in a good place so far as crossing this decade is concerned. I look at my active (and slightly mad) parents at the ages of 70 and 75 and see myself continuing in this slightly crazed fashion for some time to come! A very good friend gave me a fabulous gift to drink my morning pint of tea from. 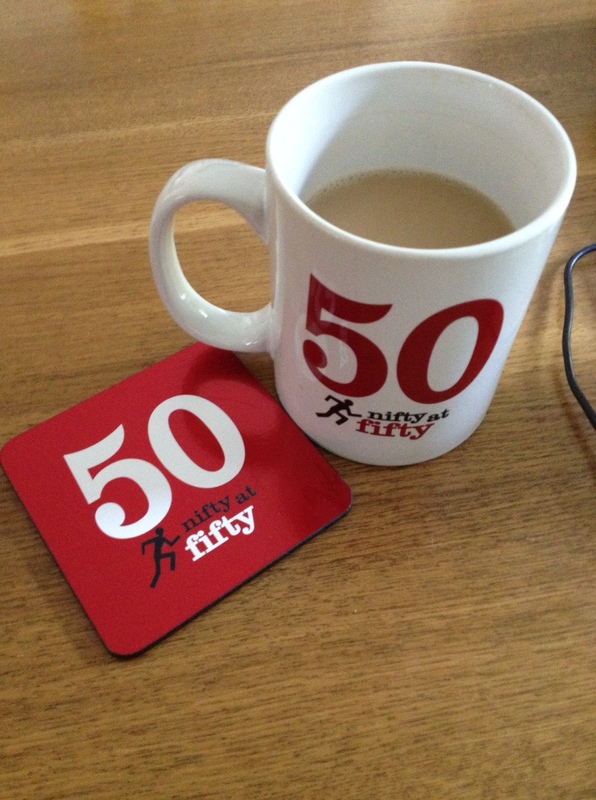 A ‘nifty at fifty’ mug and matching coaster. Despite the fact that this morning I am victim of a stinking cold, I’m still feeling nifty at fifty and, come Sunday, when I run another 13.1 miles for Diabetes UK I will still feel nifty at fifty. I might feel a bit less than nifty immediately afterwards, but what the heck! So today when you read this post you might look across to the right and see that my Gravatar has changed. I am now fifty. And if you look up to the site title you will see that I’m no longer a forty something woman running to save her life, now I’m a fifty something woman. Necessary changes, but insignificant in the big scheme of things. It’s OK, I’ve found the ‘CTRL’ button! 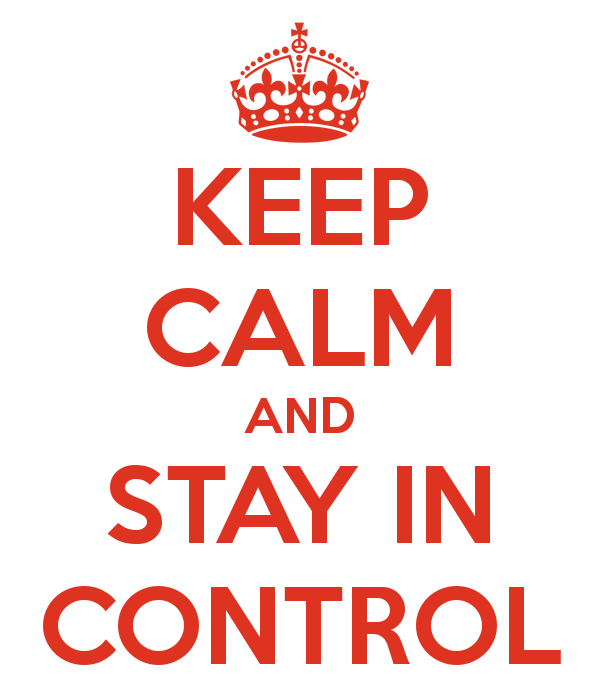 I don’t often feel quite as in control of my running as I did yesterday. Don’t ask me why yesterday was any different from any other day. Maybe it was the weather? Maybe it was what I was wearing? Maybe it was what I’d chosen to carry? Maybe it was the route? I don’t know, but I felt ‘at ease’. I had my last long run before my next race to complete, 14 miles. 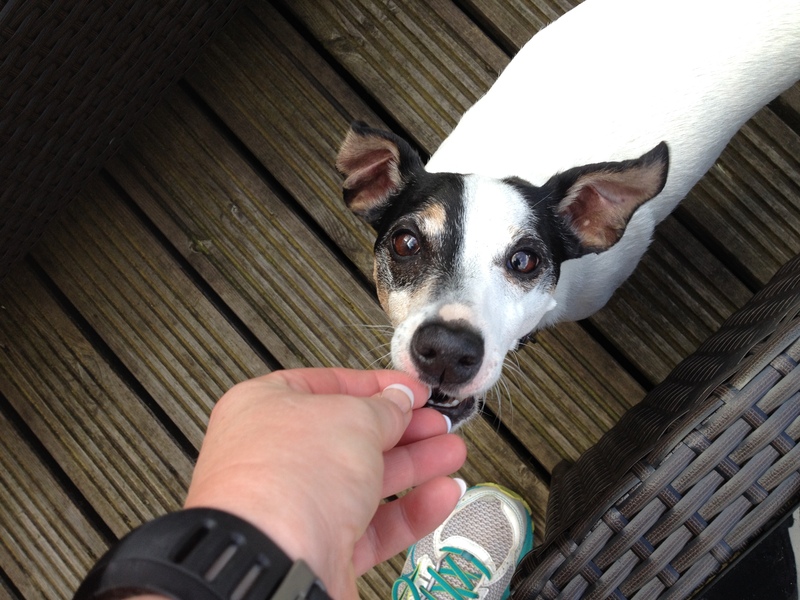 I’ve run further, so 14 miles was just 14 miles – I wasn’t perturbed by the distance. I decided to run an easy route (it was a breezy day, I didn’t need to push myself over hills as well) and, after some experimentation, I had settled on a run/walk ratio of 2.5 minutes to 1. It was going to be a steady run building up endurance, not a race to the finish. That can wait for a couple of weeks! The weather was perfect for a long run. It was, as I’ve said, a bit breezy, but as the wind was blowing on my face for the first seven miles I had the reassurance of knowing that on the way back it would be pushing me home. The temperature was also cooler than of late with the sun was just occasionally peeking through heavy clouds. Spot on long run weather. This would be the first long run I’ve managed to do in a oner for ages. I had decided to ditch the chia gels I still have in the cupboard and look for something else. I left it late and ended up at Holland and Barrett just before they closed on Sunday afternoon. I chose citrus High 5 Energy Gels which I carried in the big side pockets of my new Ron Hill trail vest. I also tool my Camelbak with 750ml of water and two High 5 Zero tablets. I had my Garmin…oh, and I wore my iPhone on my arm. I’m starting to feel a bit weighed down, I must admit! I bet if I ditched the lot I could run faster! I tried not to pay too much attention to my pace, but instead just focus on the beat of my music and try and settle into a good rhythm. I didn’t want to try and run at my race pace and if I look too closely at my Garmin I start to speed up and this affects how I finish. I needed to start steady and finish strong. I looked only at the distance I’d run, just so that I knew when to turn home. I was, however, bang on pace and when Jeff Galloway said “You’re half way” I really was. I took my gels (perfectly placed in my side pockets – easy to grab, no zips getting stuck!) at 4, 8 and 12 miles. They were more liquid than others I’ve tried, which made them easy to take. I just used them instead of water and ended up with 500ml left in my Camelbak when I finished. I’ll put less in next time. They were also very easy to open. Until now I hadn’t looked at my Garmin data. My pace was fairly consistent throughout, although my first mile was predictably faster! I just can’t help myself! I find this all very reassuring; I felt good as I ran. I wasn’t slowing up and I wasn’t speeding up – not too much anyway. My running pace was 10 min/mile pace which, of course, was brought down by the walking intervals. It was an easy pace and I can see myself either being able to up that slightly in a race or lengthen the run. Running for an extra 30 seconds at that pace should be achievable. I just beat the torrential rain we endured yesterday afternoon, it hit as I put the key in the door. I have a feeling I was being looked after. After running I stretched out, made myself a lovely plate of scrambled (free range) duck eggs and toast and ran a very hot bath. I spent the rest of the afternoon chilling out with the dog, who appreciated the fact that I was stationary for longer than a few minutes, and icing my Achilles which had been a bit sore when I was running. Today I don’t feel as if I ran 14 miles yesterday, so something is definitely right! What I’ve learned from this run is that I need to worry less about my pace and just keep it consistent. I can speed up from the half way point if I feel like it. I now have clothes and equipment which I feel comfortable in and which I’ll set aside for Fleetwood in two weeks. My only issue (and it’s a small one) is that my armband is rubbing, causing a burn mark. I was looking yesterday at something I can wear underneath it as a barrier, rather than spend more money on another armband. Maybe just some BodyGlide would do the trick.